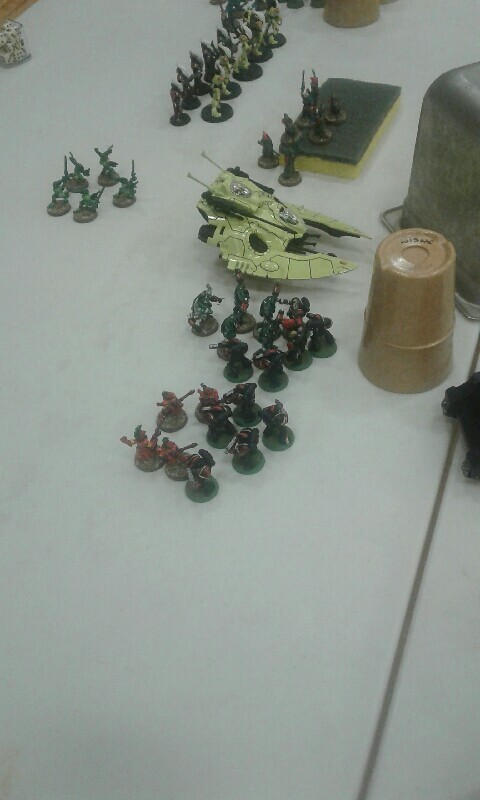 With another drill comes another game against SGT Sheldon, the person from the 40K Double Date BatRep. We started off agreeing on 1,500 points as our last game together was 1,000 points, and he wanted to flex a little more muscle with as little in the way of me teaching as possible. He did the total for his force and it came up to 2,000 points, so he asked me if I'd meet there, which I readily obliged. The mission was Rescue with a slight modification. 1,996 total. A fairly decent sized force, and light on the more powerful units. Didn't write down his total. Right away you'll notice a FOC issue. I pointed out the Biel Tan list from the Craftworld Codex that he forgot to bring, and we just cracked on with the game. Because of this, we modified the Rescue mission to a full deployment as I didn't want to complicate the game any more than we already had. Quick rolls got him picking sides, #4 being the objective marker, and me deploying first. This was pretty much the set up. It's basically ruins and a few hills, since my brother forgot to bring me my terrain box. 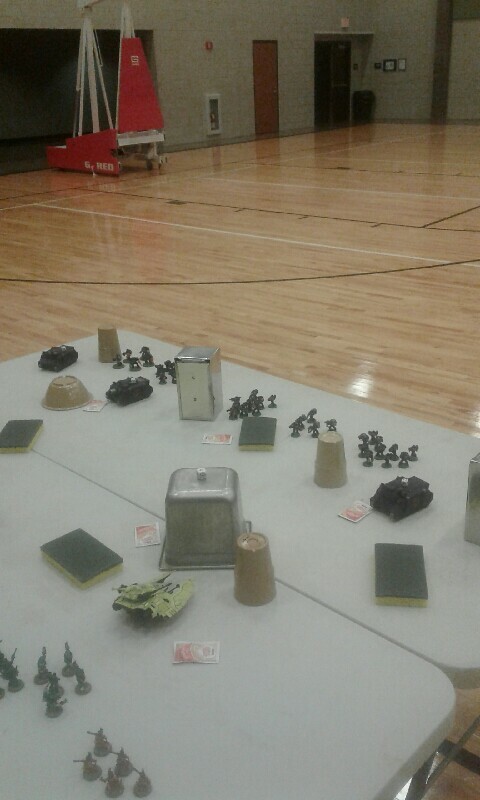 The army moves forward at top speed. 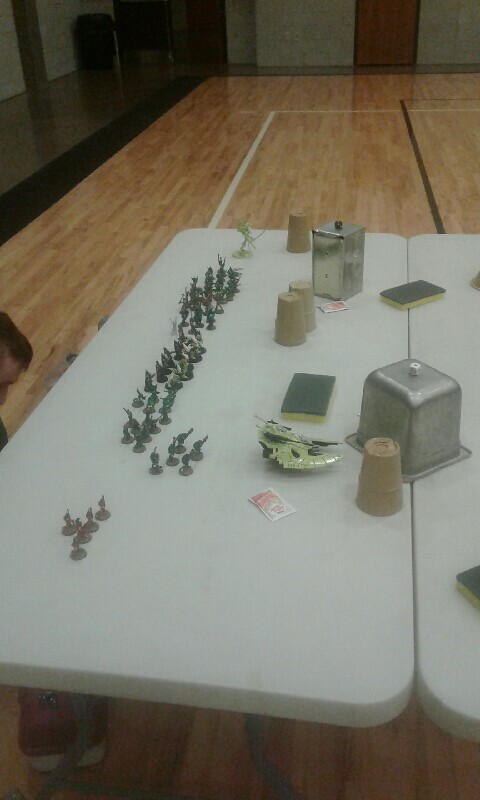 The Fleet of Foot rolls net the Fire Dragons 3", the Rangers 2", and the Banshees 1" further movement. Likewise, my army lurches forward at top speed. The Rhino on my left flank containing the Chaplain and Tactical Squad uncovers one of the markers, as the Vindicator uncovers another on my right flank. Revealed as #2 and #5 respectively, neither are the objective. All three vehicles pop their Smoke Launchers to attempt to increase their battlefield life expectancy. The Farseer casts Fortune effortlessly on the Dark Reapers. The movement phase has the Wraithlord moving up to hug cover behind one of the pillars dotting the field. Every other unit moves at maximum speed forward towards whatever objective, high ground, or cover can be had. The Warp Spiders uncover a marker revealing #1. The Falcon did not move to maximize firepower that turn. 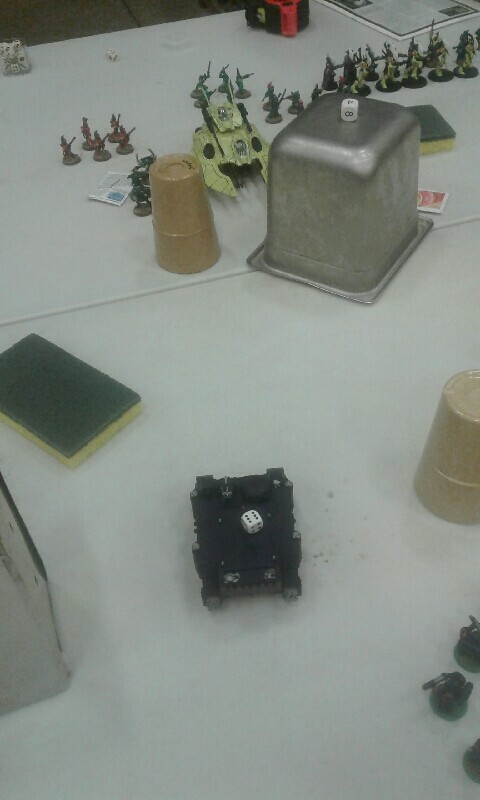 Falcon fires at the Tactical Rhino and comes up short on the roll to hit. The Guardians manage to hit the Veterans' Rhino with their Scatter Laser, but fail to penetrate the armor. 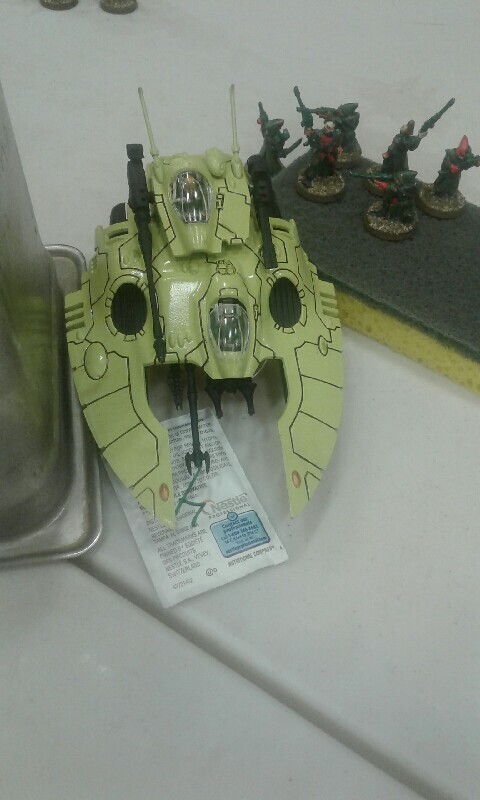 The Wraithlord scores three hits with the Starcannon but only manages to glance once, getting a Crew Shaken result. Fleet of Foot rolls see the Rangers scoring 4" to move most of their unit atop the hill, the Banshees creeping forward 1" again, and the Fire Dragons advancing 6" towards the hill on their right flank. 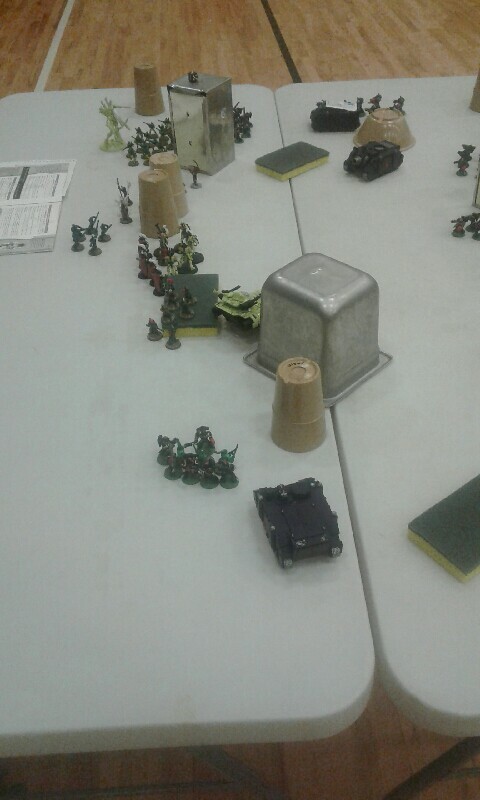 All units advance max speed with the exception of the Vindicator, who moves forward 6" to avoid lines of fire while attempting to gain a Storm Bolter shot. 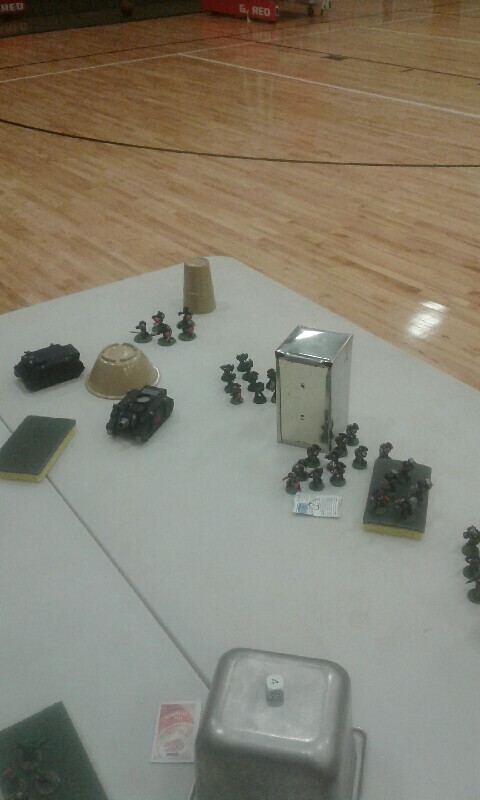 The Tactical Squad in the center of the board reveals the last counter on my side of the table. Unfortunately it is #6. The remainder of my Movement Phase sees the Tactical Squad with Chaplain deploying in preparation to charge the Fire Dragons. Shooting sees 1 Ranger die to the Vindicator's Storm Bolter, while the Chaplain's Squad manages to kill 1 Fire Dragon. The Assault Phase sees the Chaplain's Squad split charge between the Warp Spiders and the Fire Dragons. The Warp Spider Exarch pulls down one Tactical Marine while the Fire Dragons and Tactical Marines fail to do ANY wounds. The Chaplain and Veteran Sergeant, however, land a total of 7 wounds on the Spiders, wiping them out. 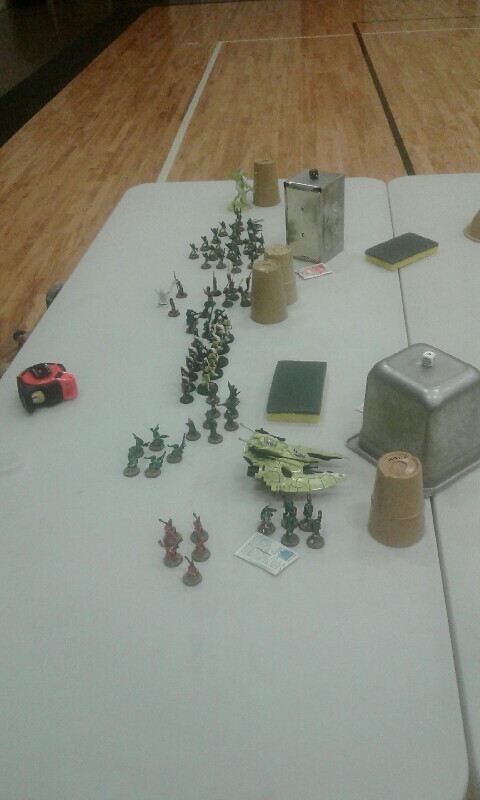 The Fire Dragons hold, and the Tactical Squad consolidates in. The Farseer successfully casts Fortune on the Banshees and Guide on the Dark Reapers again. 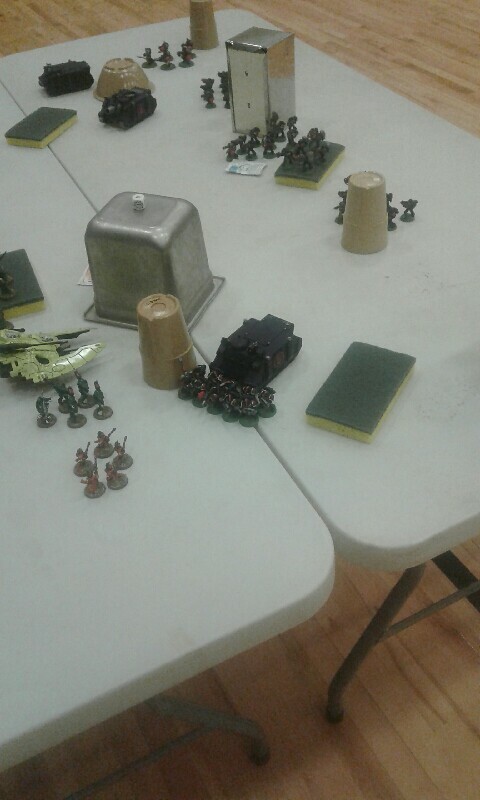 The army moves ahead at top speed again except for the Falcon, which moves 6" onto the marker to facilitate fire at that Vindicator, managing to reveal the objective at the same time. 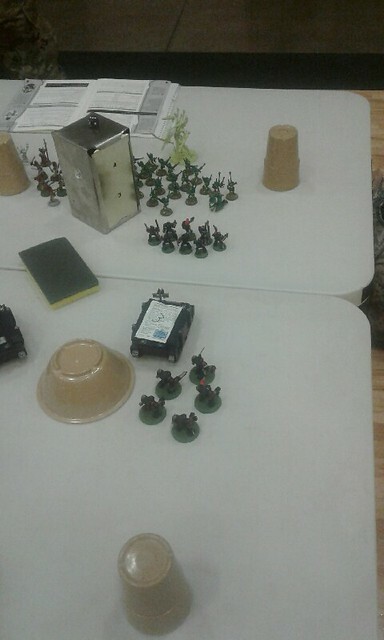 The Striking Scorpions are now in range to charge into the Tactical Squad engaged with the Fire Dragons. The Shooting Phase starts with the Guardians penetrating the Veterans' Rhino, destroying it. None are hurt in the explosion as they disembark the wreck. The Wraithlord vapes 2 Veterans which is not enough to force a Leadership check. The Dark Reapers drop 4 Tactical Marines from the center unit with the Rangers failing to wound the same unit. Leadership test is passed. The Falcon fails to hit the Vindicator. In the Assault Phase the Striking Scorpions charge in with their Mandiblasters blazing, but unfortunately they could not fine a weakness in the Marine armor. All the Fire Dragons and the rank and file Striking Scorpions miss their attacks or fail to wound. 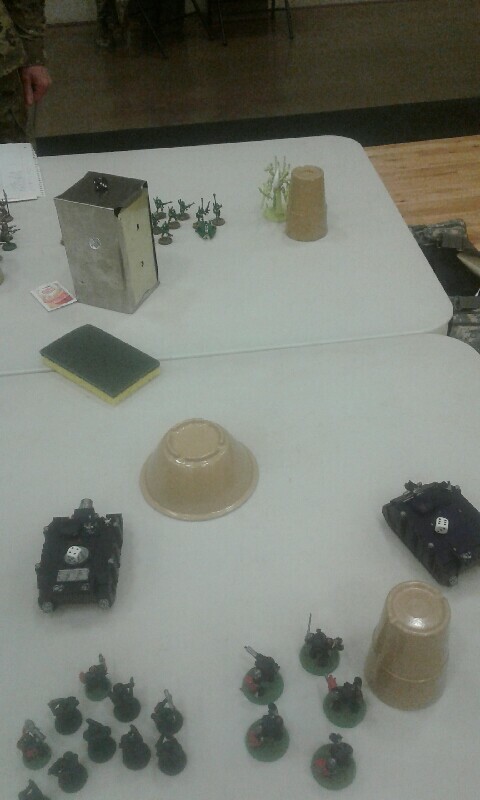 Two Fire Dragons fall to Tactical Marine attacks, 2 more fall to the Veteran Sergeant, wiping them out, and two Striking Scorpions fall to the Chaplain. Meanwhile the Scorpion Exarch takes down 3 Tactical Marines. The combat stands after a passed Leadership test. Right here the battle plan I had goes all to Hell. Sheldon and I were commenting on what the Falcon could do with the objective, and he made it clear he planned on a 24" retreat to the Wraithlord, who would take possession of it. At that point, I realized that EVERY resource would be dedicated to the destruction of the Falcon, if necessary. 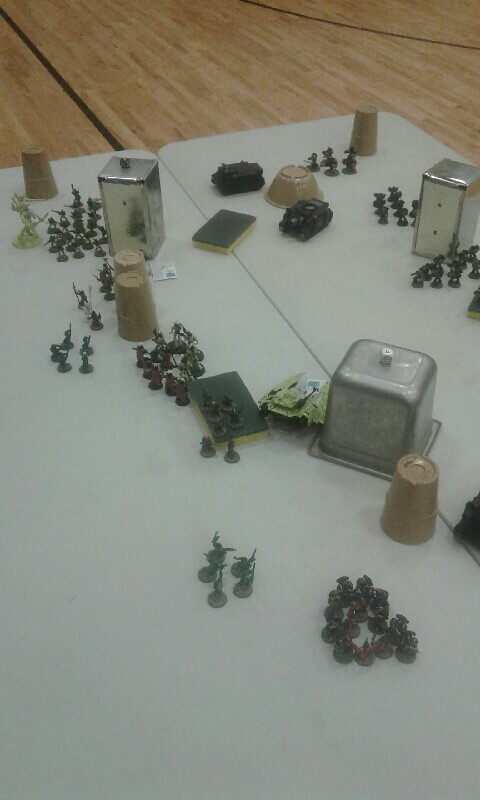 In the Movement Phase my Rhino, Terminators, and Veterans all advance 6" towards the enemy. The Vindicator stays put and is aligned in such a way that both the Wraithguard (ideal) and the Falcon (last resort) are in the fan of fire. In the Shooting Phase the Veterans with Cortez gun down 3 Guardians. 5 Banshees fall to the Heavy Bolters of the Devastators, but pass their Panic check. My Rhino fails to wound any of the Rangers. Last but most assuredly not least, EACH of my Tactical Squads either misses or rolls far too low for Penetration with their Missile Launchers. I take one last longing look at the Wraithguard squad, bundled up nice and tight for that blast template, and I lob a shell at the Falcon. Penetrating the armor easily, I roll a 4 on the Ordinance Damage chart. Destroyed. I had prevented the objective from being spirited away, and now all I have to do is go get it. The Veterans starring Cortez charge headlong into the Guardian Squad. After all is said and done, 8 Guardians lie dead at their feet, with none in return. Yet again, though, the steely resolve of the Eldar holds. The Tactical Squad and Chaplain finally finish off the Scorpions. With that, Sheldon called the game. 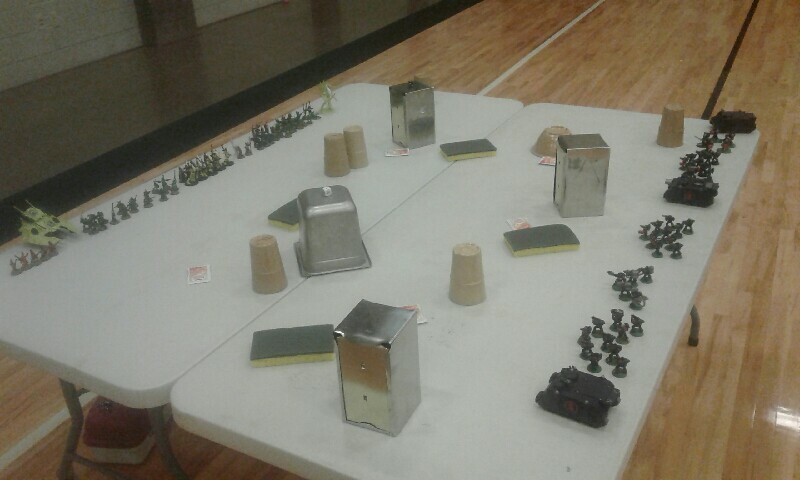 Under the victory conditions, stopping at this point would technically be a draw, but Sheldon calculated how fast I was rolling up the flanks, what little could hold the objective on his side, and the thought of that Vindicator bearing down his Wraithguard, which was now the backbone of his defensive line. He just let me know today that he's picked up several 3P Slaanesh models, and has every intention of throwing some Emperor's Children violence my way at the first opportunity. Sounds like you and Sgt. S are having fun. Keep it up. He is barraging me with pics of his new Slaanesh stuff, he's chomping at the bit to game again. Luckily he agrees that the 3.5 Chaos dex should be avoided at all costs. I would assume that the next drill would be in the armory and not in the boonies, Indiana winters being what they are, so it sounds like you may have another batrep on the way.